Justin Brittingham and Heather Bagley met after he was diagnosed with cirrhosis. She was a nurse at his doctor's office. 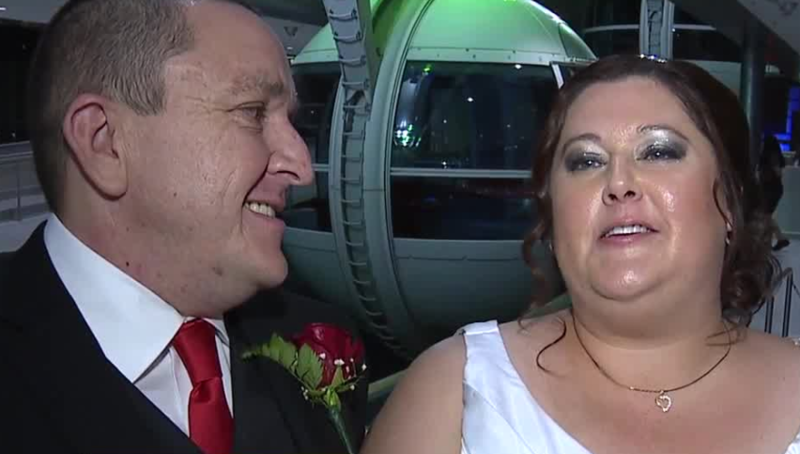 A couple got married atop the High Roller early Wednesday morning. It's the first of several weddings to take place this month, marking "magic wedding dates," including 8/1/18, 8/8/18 and 8/18/18. When he was told he didn't have long to live, the two of them had many conversations and started dating. They got engaged on Mother's Day and won the free wedding at the High Roller soon after. Earlier this summer, Caesars Entertainment conducted a Facebook contest, encouraging couples to explain why they are lucky in love. More than 25 couples from around the country entered the contest. The winning couple received the complimentary wedding inside the High Roller cabin. Destination Las Vegas provided the officiant, flowers and décor for the High Roller cabin, as well as a wedding gown, hair and make-up for the bride.